Aaron Ramsey wasn’t used to getting sent to see his Head of Year. A model student who graduated from his secondary school with 10 GCSEs, he was called to the office back in 2007 not to be reprimanded for his behaviour but instead to be told he would be representing Cardiff City against Hull that Saturday. Sent into action as a substitute, he became the club’s youngest ever player and quickly drew attention from the top sides, eventually joining Arsenal less than 12 months after his Bluebirds debut. “Ryan Giggs was relentless in his quest to try and land his fellow Welshman,” Sir Alex Ferguson revealed in his book Leadership. A broken leg stalled his career in North London but, after loan spells with Nottingham Forest and Cardiff, Ramsey recovered to become a regular for the Gunners and has made over 350 appearances. He has helped them win the FA Cup on three occasions and scored in two of those finals, also having the honour of being named Captain for Wenger’s final game in charge at the end of last season. Also named the club’s Player of the Season for 2017/18, it was no surprise that – with Ramsey’s current deal set to expire in June 2019 – one of Unai Emery’s first acts after replacing the Frenchman was to offer the midfielder new terms. “For me, every day, every training session, he has the ambition I want,” the new boss said during a press conference back in July. Yet when Ramsey went to accept that offer, it was seemingly no longer on the table. “Everything has been going great with the club, we thought we were in a position where we had agreed a deal but that’s no longer the case,” Ramsey told The Guardian in October. He has certainly done that in 24 appearances this term, weighing in with three goals and six assists, making it difficult to see why the club has had such a change of heart. A number of reports claim Mesut Ozil’s lucrative new contract – one which has made him Arsenal’s best paid player ever with a weekly salary of around £350,000 – raised the bar too high, while the departure of Ivan Gazidis is also believed to be a major factor. The former Chief Executive was thought to have been a key figure in offering Ramsey a new deal, but when he moved to AC Milan in September, those left in charge seem to have other ideas. Whatever the reasons, an exit now seems almost inevitable and, given his wealth of talent and tireless box-to-box athleticism, there has been no shortage of potential suitors looking to sign the 28-year-old. Gazidis had hoped to bring him to San Siro, while Bayern Munich (20/1), Everton (16/1) and Paris Saint-Germain (8/1) have all been listed as potential landing spots for the Welsh international. 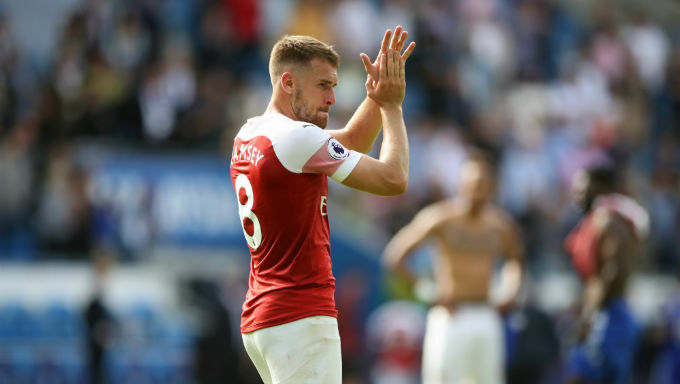 However, it is believed that Juventus are the side to have the inside track, the Old Lady elbowing her way to the front of the queue by offering a pre-contract agreement that Ramsey can sign any time after February 1. Some of the top bookmakers, such as Coral at 1/2, have Ramsey odds-on to make the Serie A switch in the January transfer window, but there’s much better value in the 5/6 on offer at Red Zone, one of the best new bookmakers, for Ramsey to remain at the Gunners until the summer. Betway offer a longer price on Ramsey to sign for Juve this month at 5/4, but admit their odds have been influenced by increased interest in their market. “The money just keeps coming in support of Aaron Ramsey joining Juventus in the January transfer window and we’ve had to cut his price again in the last 24 hours,” said Betway representative Alan Alger. The smart money, though, is on Max Allegri to snap him up for nothing in the summer. Many of Italy’s most reliable transfer experts have reported that as fact, with Sky’s Gianluca Di Marzio noting that the player has rejected a more lucrative offer from PSG to agree terms on a deal worth €7 million per season with Juve. There had been talk that the Serie A favourites were willing to send Sami Khedira in exchange for taking Ramsey in January, but it seems any chance of getting him earlier than the summer has been rebuffed by Arsenal. Should he arrive in Turin, Huw Davies – a Welsh football writer and former Managing Editor of FourFourTwo – believes he might be an ideal addition. “Ramsey would be entering an extremely competitive dressing room and midfield – he's far from guaranteed a place in the starting XI,” he says. “He'd have his work cut out at Juventus, but he's overcome bigger problems before – not least a major injury in his formative years,” Davies continued. It remains to be seen where he makes his next stop but, just like on that trip to the school office ahead of his 2007 debut for Cardiff, Aaron Ramsey probably has little to fear when it comes to joining the Old Lady, but a lot to look forward to.